Ground level targets should have a proper backstop. Maintain the proper target height to ensure that the fired projectile, after passing through the target, hits the desired portion of the backstop. This will reduce the possibility of ricochets. Shoot only at authorized targets. Use paper, cardboard or clay targets only. Do not shoot at glass, metals, plastics, or electronic components. When outdoors, target shooting can cause fires under certain conditions. Check current fire conditions and don't shoot dry vegetation. Avoid shooting on hot, windy days. Do not shoot at metal objects. Be prepared; keep a shovel, fire extinguisher and extra water on hand. Always keep the firearm completely unloaded until ready to use. Always keep the firearm pointed in a safe direction. Don't point the gun at anything you don't want to shoot. 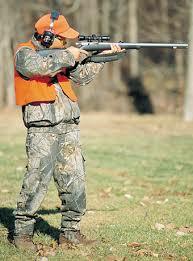 Keep finger off the trigger and out of the trigger guard until the gun is pointed where you want it. When unloading the firearm from the bag, make sure it's pointed down range. Load firearms at firing line only. No loaded firearms should enter or exit the premises. If leaving firing line temporarily, leave firearm on firing line unloaded with action open and muzzle pointed down range. Carry only one gauge/caliber of ammunition when shooting. When at a shooting range with more than one firearm, use one at a time and when complete, store that firearm and its ammunition before using the next one.